Originally Submitted to FurAffinity.net on October 26th, 2010 11:07 PM. 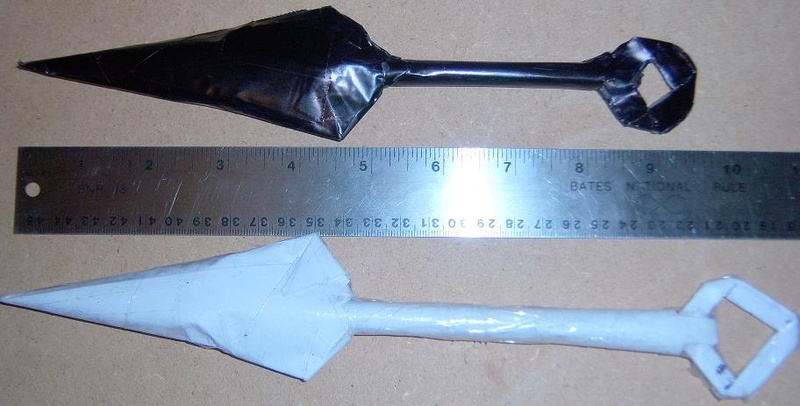 This was my very first attempt at a paper weapon but I think they came out all right the black one is about 9 1/2 Inches from tip to end. The white one is about 11 Inches. I got really board last night and decided to make some so here is how they came out. Well, a sword is a big thing. Start smaller, with a tanto, maybe. Start small, work up. After the tanto, maybe a wakizashi, then a broadsword, a katana, and work your way up to a greatsword. I'm looking forward to seeing more from you! No, I can show you what a real one looks like, if that helps, but I have no idea where to find plans to make them.